An exploration of awe-inspiring interiors. Planning a room design: where to start. It can be quite daunting task approaching a room design, there’s so much choice available. The world is your oyster and I’ve had a few people say recently they just have no idea where to start. So I thought I’d give some handy hints and share some insider interior design tips that might just set you on the right path to achieving interior bliss. I’ve broken the process down into 5 steps and hope to share more details on moodboards and colour schemes in the coming weeks. First up, you need to determine the purpose of the room. Is it going to be an open plan, kitchen-diner/living space where all the family will spend their meal and leisure time or a cosy snug come games room for a couple to chill out in the evenings? This will determine what key elements or pieces of furniture you will need within your design and also inform the layout and lighting. Does it need to be multi-functional? Space comes at a premium and many people are short on it, therefore spaces may need to double up or you might need to get clever with storage (you can never have too much in my opinion). Spare rooms often double up as home offices or dressing rooms and dining rooms/kitchens may need a play space or homework area. Or you may be lucky enough to be designing a more unusual space such as a home cinema or music room (one for the wish list). Think about who is going to be using the space, obviously a family of 5 with young children would have very different requirements to an elderly couple or a young, single woman. And someone into gaming or hosting parties may require a large dining space with lots of seats and a plug socket or two nearby, but if you’re someone who eats out or travels away a lot, a smaller dining area or a breakfast bar may suit you better. Ask yourself what you currently like about the space and what you would like to change? Or which pieces of furniture would need to stay? Obviously if it’s a new build or extension you have a blank canvas to work with and will need to think carefully about placement of more permanent structures such as radiators. Also consider the scale of the room and choose furniture in keeping with that scale. If you go too large the room will feel cluttered, too small and it will look lost and you won’t have utilised the space. Also ensure there is room around each piece of furniture, ie you can access the bed from 3 sides (unless it’s a kid’s bed), there is still space around the dining table when the chairs are pulled out or you aren’t going to be tripping over your coffee table. People often think that furniture should be squashed against walls to create a feeling of spaciousness, but actually pulling furniture away from walls even by a couple of centimetres can give the illusion of more space, as can wall mounted storage and furniture on legs, a useful tip for a small room. One of the best ways to consider the layout is by mapping it out on graph paper and moving furniture templates around until you get a combination you’re happy with. Think about which times of day you use the room, for example a bedroom will mainly be used in the mornings and evenings and you may want soft mood lighting, but a kitchen-diner or a study may be used throughout the day, in which case you may want to optimise natural light and have bright task lights for certain spots. Make sure you also have a budget in mind as this will affect your choices further down the line. If the budget is tight decide which elements are the absolute essentials for the functioning/feel of the room design and invest in those to the highest quality you can afford. Once you’ve considered all the practicalities it’s time to seek out inspiration. Collect paint chips, fabric samples, tear snippets out of interiors magazines and set up a Pinterest board. Inspiration can come from literally anywhere, it could be a vintage print on your great aunt’s curtains, some colourful packaging or a celebrity’s home you saw on instagram. Fabrics and wallpapers are a great source of inspiration as they provide a ready made colour scheme and come in wide variety of patterns. Think about why you are drawn to certain images or colour combinations and see if you can pick out any similarities or themes, which will help you figure out your style. For example, I’m drawn to deep jewel colours and greens and I also like high contrast. I would say my style is eclectic with a mix of Industrial Art Deco and Boho Scandi. I also love mixing old and new and using lots of natural materials. Thinking about how you want the room to feel can help you narrow down your image choices, create a list of adjectives that describe what mood you want to create in the space and pick 3 to focus on (for example inviting, fresh, calm). Then narrow down your images to those that fit the description or that you really love. If you already know you’re drawn to a particular style, for example country style, source a magazine in keeping with that, like Country Living to provide you with inspiration. 3. Pick a colour, any colour. If only it were that simple … Colour schemes can be hard to get right and if you’re unsure it’s best to ask advice from an interior designer. But a good starting point is to consider the light in your chosen room. The direction the room is facing determines how much and what kind of light a space receives and as result which colour palettes will work. For example north facing rooms get the least light and the light can be quite harsh and cold, meaning that cool colours will only exemplify this and make the space feel colder. Therefore it is advisable to use warmer colours or colours that have a yellow base as opposed to a grey/blue base. Sunny south facing rooms, can pretty much get away with any colour scheme as they receive a lot of light through the day and the light is warmer. East facing rooms receive their light in the morning and the light can often appear blue, therefore its bet to work with the light and choose warm pale blues and greens. Whereas West facing rooms receive the light in the evenings, so will appear cooler earlier in the day and warmer later on. A good source of information regarding colour and light can be found on the Farrow and Ball website. They also provide inspiration with ready made colour schemes using their paint colours and there’s a customer photo gallery, so you can see how colours work in different spaces. As a general rule and if you’re a beginner to colour scheming, its advisable to stick to 3 colours (plus neutrals) and follow the 60-30-10 rule. Your main dominant colour should cover 60% of the surface of the room (usually walls). Your secondary colour should cover 30%, so perhaps flooring, large upholstery or curtains and your accent colour (usually a brighter, contrasting colour) should cover 10% so soft furnishings or objet d’art/accessories. There are lots of different types of colour schemes and I’m planning to do a more in-depth blog post on those at a later date. But what I will say is: the colour wheel is your friend! If you can come to a decision on one particular hue, blue for example, you can then look to the colour wheel for colours that either sit next to that colour, are opposite that colour or are evenly spaced around the colour wheel. Lighter and darker tones of the same colour will also work together harmoniously. Every room should have a focal point. It helps create wow factor and gives the eyes somewhere to rest upon when entering a space. I talked about this in my previous adding character post, but it’s here where architectural features come into their own. If a room has a fireplace or chimney breast, draw attention to it! This may be through colour or wallpaper, but it could be more subtle by adding an elegant mirror for example. Other focal points could be a grand staircase, windows, architrave, ornate cornicing or built in bookcases. Painting certain elements in a different colour to the walls can help these features stand out. But equally it doesn’t have to be a permanent feature of the room. It could be an armchair upholstered in a bold print, a headboard in a deep velvet or an interesting light fitting. It can also pay to have one item that is out of scale with the rest of the room. I know I talked before about keeping everything in scale, but sometimes you need to bend the rules and having one piece that is out of scale with the rest adds real interest. Once you have an idea of furniture, layout and colour, think about the finishing details and how to add layers to your room design. By this I mean consider all the design elements, especially texture. If you’ve used all the same finish and texture (e.g white glossy kitchen cupboards, white glossy table, white walls) your room will feel very flat. Mixing materials and different textures and patterns adds interest and depth. Soft furnishings are a good way of doing this, for example a mix of cushions in velvet, wool and linen, creates a textured look, but if you stick to colours within your colour scheme they won’t look out of place. Metallics are another way of adding interest as they reflect the light and add another material in the mix. Think about different levels of light, if you can, always install a dimmer switch in the kitchen, so you can create atmosphere in the evenings. Pendant lights work well over dining tables and breakfast bars and feature lights and chandeliers can add drama in the living room and bedroom. Always try to have a few different sources of light, for different times of the day and to create different moods. How to add character to a new build. I’ve always been drawn to older houses, I was lucky enough to grow up in a Victorian house and now occupy a 1930’s semi. Both houses had/have a number of interesting period features, think fireplaces, ceiling roses, stained glass, original doors, storm porches and staircases. These much sought after features not only score highly on the character scale, but unfortunately they also bump up the asking price. Vintage 1930’s fireplace and traditional dedo rail in our current lounge. In the current climate, finding a house with the ever elusive character which isn’t buried under 2 inches of shag pile carpet, cat wee and wood chip wallpaper and quaintly labelled a ‘doer upper’ can be a hard task. Many people, particularly first time buyers are priced out of the market and so a new build can be an affordable alternative. More often than not newer properties are on an estate with other houses built by the same developer, in a very similar if not identical style. Make your property stand out by changing up the front door, so it’s different from the others. You could go for a completely different style or simply give the existing door a lick of paint (perhaps in a bright colour if you like to make a statement). If you’re a fan of pink, check out the front door of Pink House blog founder Emily Murray (http://www.pinkhouse.co.uk/blog/2017/12/3/the-big-pink-house-hogmanay-party). You’ve guessed it her door is in a delicious shade of pink – Nancy’s blushes by Farrow and Ball to be precise. It’s fun and stylish and makes your home unique. If you’ve not got the funds to replace a door, paint is a great way to add character and FYI it is possible to paint upvc! New hardware (think door bling not computer geek) is another way of adding character & your own style. There are some great vintage knockers (snigger) and handles out there that you can salvage and also an extensive range online. I particularly love the brass bee door knocker by Period Features as shown below (click picture for link). The front door is the first impression people will get of your home – make it count! Create a focal point in every room. *Note: Depending on building methods, you may need to wait a year before wallpapering or painting the walls in a new build to allow for shrinkage. Loving this on trend tropical print & note the wooden wall cladding. Also, why not wallpaper the whole room to create a real wow factor rather than just the one wall? Or how about wallpapering the ceiling for a more dramatic, but cost effective statement? If you’re on a tight budget try ebay where you can often pick up excess rolls of designer wallpaper for a lower price or even some vintage prints. Another option, is to add in some of the missing architectural features such as fire surrounds, ceiling roses and cornices. This can add interest and make rooms less of a blank box, although less is probably more if you don’t want your place to look gaudy. Try the reproduction plaster company for a variety of different options (https://www.reproplaster.co.uk/collections/ceiling-roses). The focal point doesn’t necessarily have to be a permanent fixture, it could be a statement piece of furniture or accessory. For example a velvet sofa in a bold bright, a glamourous headboard, a dramatic mirror or a glass/metal chandelier. Instant glamour; Mobile pendant from West Elm. Loving this bold print on the Anthropologie Moresque chair. Add wow factor with bold brights, Tivoli sofa from Swoon Editions. Add a splash of colour. Paint is the easiest and quickest way to add some personality to your home. Not being shy of a paintbrush or a bold colour palette myself, I can often be found adding a lick of paint to walls or furniture around our house. Although I usually end up with more paint on me than the actual walls, so it’s usually best to get the professionals in. Plus you don’t want to have to redo the painting in a hurry. The accessories & white sofa really pop against this dramatic blue background. If you’re colour shy, test out colours on a large piece of lining paper first and move it round the room in different light to see what it would look like. There are a number of different types of colour schemes, which I will be going into in more detail in another post. But for a starting point I always think it’s best to find a print or a pattern or an image that you really love and use that as the basis for your colour scheme. Perhaps a cushion or a rug, or have a snoop around Pinterest for some ‘Pinspiration’. If you’re still waiting for the walls to dry out before decorating, probably the biggest colour impact you can make is with a large rug. Although it’s worth considering your overall colour scheme and whether the rug will fit in with that later on if you decide to paint the walls. A brilliant way of putting your stamp on a property of any era is through your choice of artwork. If you have a blank wall – fill it! You can choose pieces that are personal to you and your family or just quirky pieces you like. If you’re on a tight budget you could even frame postcards, book covers, album covers or find free prints online. If you’re creating a gallery wall, either keep all the frames the same colour or link the pictures together through a similar colour scheme. Scandinavian style posters are bang on trend at the moment and there are a number of websites that have a great choice of prints and pictures (try Desenio or King & McGaw). When fixing heavier frames or mirrors to plasterboard walls, try to find the timber studs to screw into to ensure that they don’t fall off! For full length mirrors, you could consider leaning them against the wall instead of hanging (ensuring that they are fixed at the top and there’s no danger of falling on little people). Chances are if you’ve bought a new build, the fixtures & fittings may already be in or you may not have thought about changing them. But this is one simple way of upping the style stakes in your home. For a high end luxe feel Buster and Punch have a fantastic range of metallic toggle switches (https://www.busterandpunch.com/electricity/toggle-switches). Admittedly they’re a bit pricey, but they practically scream style. I’m also partial to an industrial socket or two (http://bit.ly/2BFrSUC) which can be picked up at a much lower price tag. Although it might not seem like these additions have much of an impact, they can really complete a look & change the feel of a room. Although not always a permanent fixture, this is a very affordable, quick and easy way of brightening up your home. Try charity shops for a selection of vintage, ceramic and different coloured glass vases, they are usually a treasure trove for this sort of thing. A selection of plants and planters. So there you have it my 6 top tips for styling up your new home. If you or anyone you know is wanting to banish the beige, try out some of the above and your home will be bursting with character before you know it. Creating your own natural Christmas wreath. Now Christmas might only be 13 days away, but it’s never too late to add a little more festive jazz to your front door (if you haven’t already). While there are some amazingly creative wreaths out there, think brightly coloured baubles, painted feathers & pompoms. I must admit to preferring those that are a little more rustic and show off nature’s bounty at this time of year. I’ve wanted to create my own wreath for several years, but it’s one of those things that I’d never got around to doing or thought I’d left it too late and instead just admired friend’s and neighbour’s ones from afar. I did toy with the idea of signing up for a workshop, but decided to save myself the £30/£40 and make one myself. I may well indulge for next year, as florists are always going to have a good selection of flora & some good tips to make an interesting wreath. But if you’re prepared to dry some flowers or pick up a few extra bits, yours could be just as jazzy and if you invest in a good willow/wire ring you can reuse it year after year without needing to pay anyone else a penny. The hunt for a wreath ring turned out to be the hardest part, I knew I didn’t want an Oasis one (that nasty green plastic foam stuff that crumbles when you look at it & makes you itchy). But that’s all the local florists seem to stock. I managed to find a wicker one online at Wilko (click picture for link), but they didn’t have it in my local store. Cup of tea & a mince pie, optional. Find some bendy branches or twine. I used these green stems cut from our winter flowering Jasmine plant in the garden. Bend to form a circle and tie with pieces of string or florist wire (I didn’t have any florist wire initially so used small pieces of string). Take extra stems and weave them in and out of the circle you have made. Securing in place where necessary, but once you’ve weaved a few you’ll find they’ll secure themselves. Take a sip of tea and a bite of mince pie. Trim off any ends sticking out. Add the final flourishes, or rearrange if you’re not happy with it. For a simple, but effective wreath, try and keep the colour scheme to one or two colours, in addition to the green. Add a sprig or two of holly and a ribbon and hang your wreath on the front door using a wreath hanger (or you could use a long ribbon). I cut a triangle out the ends of the ribbon to add a bit more detail, but it also looks good without. Apologies for my absence of late, I discovered the world of instagram (@decor.junkie – come say hi!) and also have a toddler who decided to stop napping (nooooo! ), well actually he temporarily stopped napping and now we’re back to every few days, which is better than nothing. While he’s asleep is the perfect time to try and sort his toys, because otherwise he decides he can’t live without that annoying musical toy that he hasn’t played with in 9 months and you just can’t get rid of anything or tidy up. As much as you try to only buy nice wholesome wooden toys, it’s inevitable that some brightly coloured plastic crap (usually with lots of buttons and irritating noises) will find it’s way into your home. So my solution is to find stylish ways of storing toys away when not being used. Below I’m going to list some of my fave storage solutions for said plastic crap. Obviously a toy box is a good place to start. Argos have some fairly reasonably priced ones, including a plain pine one that you can easily paint or customise yourself. I went with a white one from Sue Ryder online as it was a bit smaller than some of the others I’d seen and had a soft close lid (avoiding squashing small fingers!). It cost us £49.99, but is now on sale for £39.99 with 10% off for new orders. Click photos for link. Baskets are pretty much everywhere at the moment and there are some really pretty ones about. They are such an easy way to tidy things away, as you can just bung everything straight inside. The down side being that it takes literally 2 seconds for the toddler to tip it all out again. I’m a little in love with Oli Ella baskets, they have some gorgeous designs and I will definitely be adding a few of their styles to my collection. See my favourites below. Belly baskets are also cheap and simple option (Ikea have some for £9, although make sure they’re in stock before you drive an hour to your local store to get some like we did!). I’m also loving all the grey and felt storage baskets around at the moment, like the one below from John Lewis. Vintage storage solutions are a good one, as they add heaps of character, can usually be found cheaply second hand and are pretty good on the environment front. I love the old steamer trunks that have plenty of space and can even be used as coffee tables. However, they can be quite hefty and take up a fair bit of space, so something to be aware of. I’m keeping my eye out for a reasonably sized vintage leather suitcase as I think it would make a great home for the wooden train track and train paraphernalia we’ve accumulated. Metal trunks are a great way of adding an industrial vibe with tons of storage. I’ve already bought one metal trunk and went with this one from Habitat, which cost £40.00, but I’m thinking about getting another larger one to stack underneath. They’re quite hardy and will stand up to a fair bit of bashing from kids, also a few dents and scratches won’t look too amiss and will only add to the industrial look. I’ve found that the clasp on this one generally flips in the way if you knock the lid down. But trapped fingers could be an issue with other styles, so might be one for older kids! Other toy storage options include stacking boxes, crates and lidded bamboo or seagrass chests. I particularly like this ‘Mr bear’ pull along crate from Great Little Trading Company (£40), bamboo lidded storage from Habitat (from £30) and wooden stacking crates (£30 GLTC). So it’s been a while since I’ve posted, not for lack of motivation, but time to myself has been pretty limited. Today I decided to set myself a challenge while out shopping. With a £5 budget I had to find a second-hand bargain for the house from one of the local charity shops. I love browsing charity shops, you never know what treasures you might find. Not only is it good for your wallet, it helps create funds for charities and there is the added bonus of being good for the planet, reducing demand for newly manufactured goods by reusing those already in circulation. A few months ago I picked up a complete vintage tea set for only £3.99 and I’m pleased to say today’s challenge was equally as successful, with 2 items purchased for under £5 and the change even went in the donations pot! I browsed a few shops before settling on my final purchases, with a lace curtain and art deco vase nearly making the cut. But in the end I settled for an Aztec style table mat and peacock decorated jewellery bowl. As you can see below the new additions are already making themselves at home. Mixing old and new: I’ve always been a fan of mixing old and new – because you get the best of both worlds! Classic, timeless pieces can blend effortlessly amongst modern styles and technology. With the recent minimalist trend, certain interiors can risk becoming bland and sterile, but with the addition of vintage or retro pieces, you can inject character into a room. I for one am very happy to see this trend gaining popularity. High Contrast: This trend draws parallels with the mix of old and new. Creating a contrast of styles or textures creates interest and adds depth to a room scheme. I think this trend will most prominently be seen in kitchen design with a move away from plain white and cream gloss units and shift towards a mix of monochrome cupboards as well as contrasting the plain gloss units with more interesting and warming wooden cupboards. Graphic Tiles: Geometric prints have been making a statement in kitchens and bathrooms throughout 2015 and this trend looks set to continue. These bold prints and patterns can be used to jazz up walls and floors, while giving a modern edge. Brightly patterned fabrics: Vibrant fabrics with an Asian and South American influence are likely to be big this year. With the Olympics in Rio this year, Brazilian colour influences and exotic motifs are likely to be seen across fabrics and textiles. Philippa Prinsloo, design manager for John Lewis Home, says Brazilian themes will be big. ‘Brazilian brings out vibrant greens that celebrates the more exotic flora and fauna of jungle and the Forest,’ she said. ‘The bright colours help to accessorise a space and do so with a bit of wild abandon.’ Brightly coloured patterned fabrics can add warmth to a room and are a great way of adding style that can be easily changed. Statement lighting: Lighting is a big trend at the moment and an excellent way to creature a feature in a room without too much disruption. We’ve seen the growth of pendant lights, especially in kitchens and above breakfast bars, as seen here. This is likely to continue with more statement lighting making it’s way into other rooms. Metallics: Metallics have been on trend for a while, with copper taking centre stage. With more 70’s influences appearing, a shift towards brass and gold accents looks likely. From appliances, to hardware to light fixtures, warmer metals will be adding interest, style and glamour to interiors in 2016. Calm, soft tone colours: This year’s Panetone colours (Rose Quartz & Serenity) provide a calming colour palette; with some predicting the soft dusky pink will become a staple neutral. These colours, reminiscent of the 1950’s work well with retro and mid century looks. More eclectic kitchens: Kitchens are likely to lean towards a more lived in look in 2016. This makes sense with kitchens being the heart of the home. The move away from stark, single colour units and the introduction of contrasting units as well as natural elements, continues this trend. Open wooden shelving can help to achieve this vibe, with mismatched ceramics and crockery on display and easy to access. Statement bathroom mirrors: 2016 will see the introduction of luxe, high impact bathroom mirrors in place of medicinal mirrored cabinets. This is a fantastic opportunity to add glamour to your bathroom. It can also help maximise space in what can often be a small room by reflecting light at the same time as creating a focal point. I’ve just picked a few of the key trends likely to be gracing interiors over the next 12 months, there are many more which may or may not take off. It will be interesting to check back in later in the year to see which trends have made most impact and if any unpredicted trends surface. While it is important to be aware of the changing trends, it doesn’t mean you should be remodelling your entire house based on them. You may like to pick and choose according to your preferred style or you may not follow trends at all, but prefer more timeless decor. 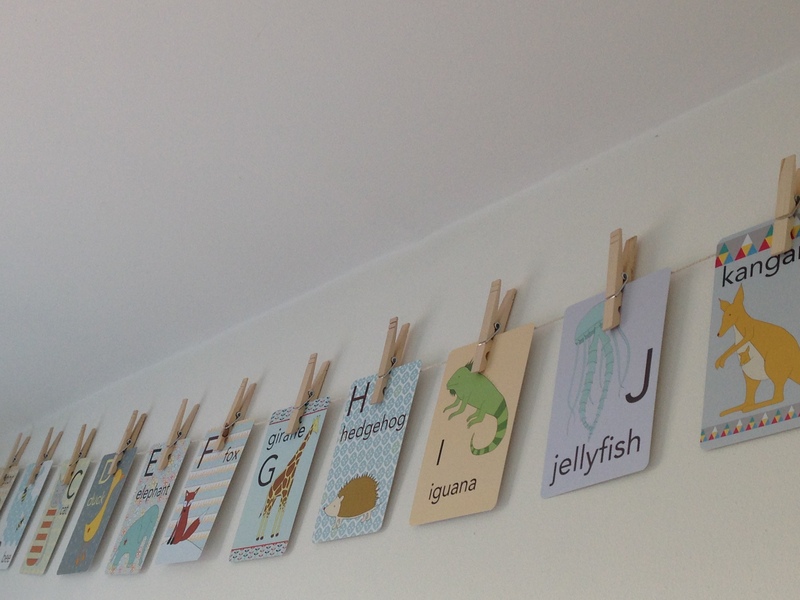 Whilst browsing on Etsy I couldn’t help but notice these gorgeous alphabet cards. I was so excited to put them up after ordering them and waiting for them to arrive. I just had to share! 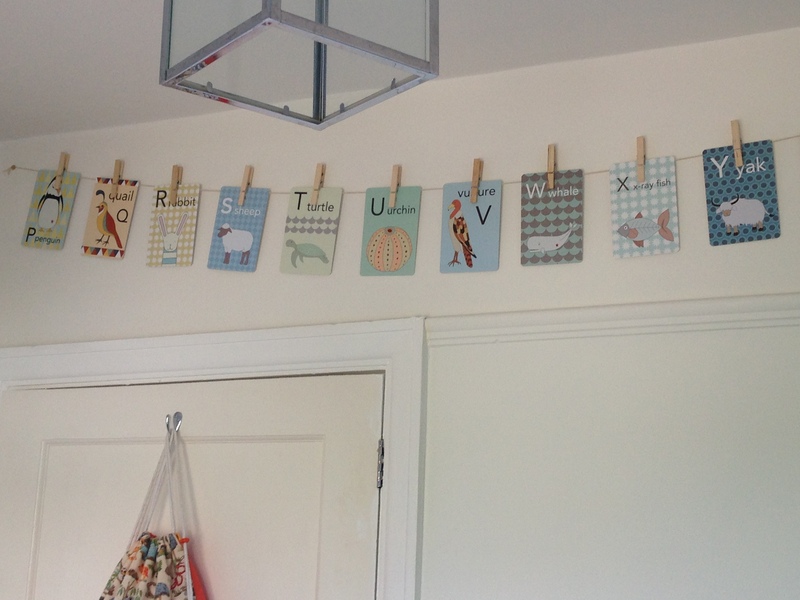 I love the cute, but not too cutesy designs and hope as my boy grows they will help him to learn as well as looking stylish on the nursery wall. Visit Alex's profile on Pinterest.